I used to post the vast majority of my photos in black & white but switched to posting mostly color a while back. 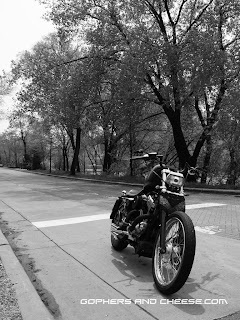 I can still hear my high school art teacher Mr. Darty telling me to "push the values", referring to increasing the contrast and making the dark areas black so all my drawings didn't end up various shades of gray. 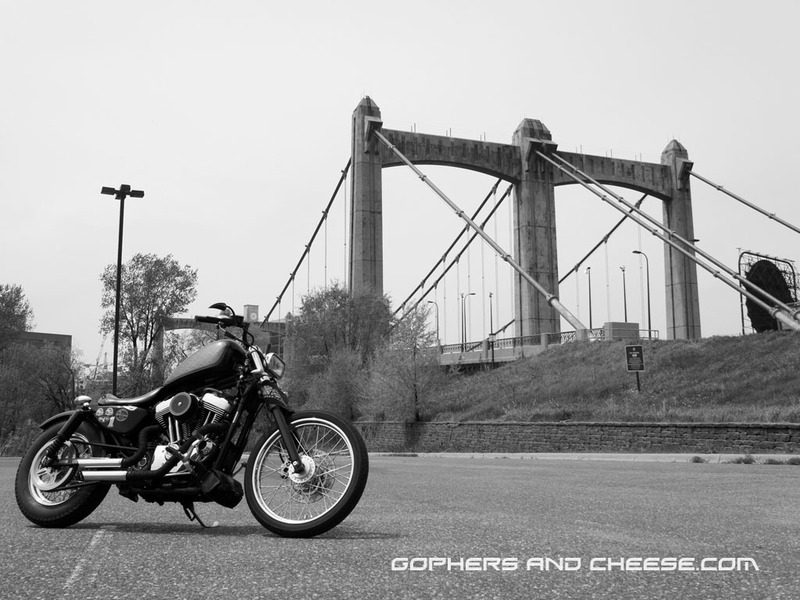 I still try to follow that very clear & helpful advice when editing my B&W photos. 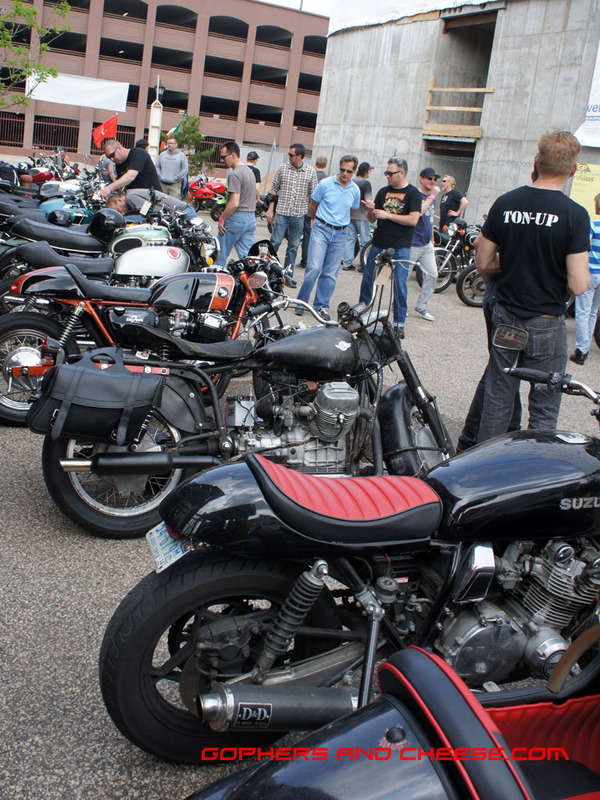 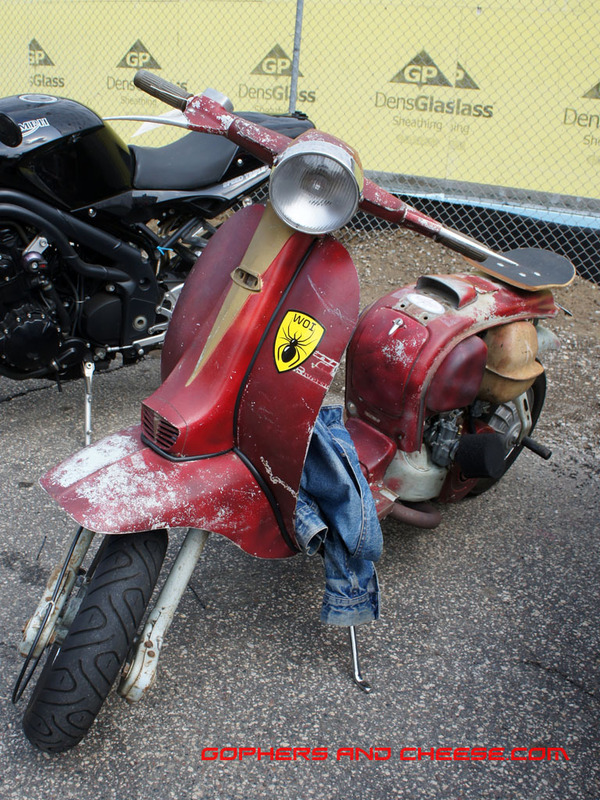 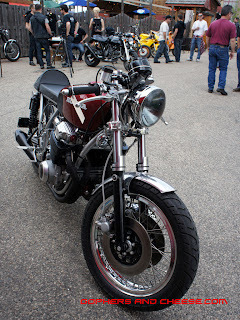 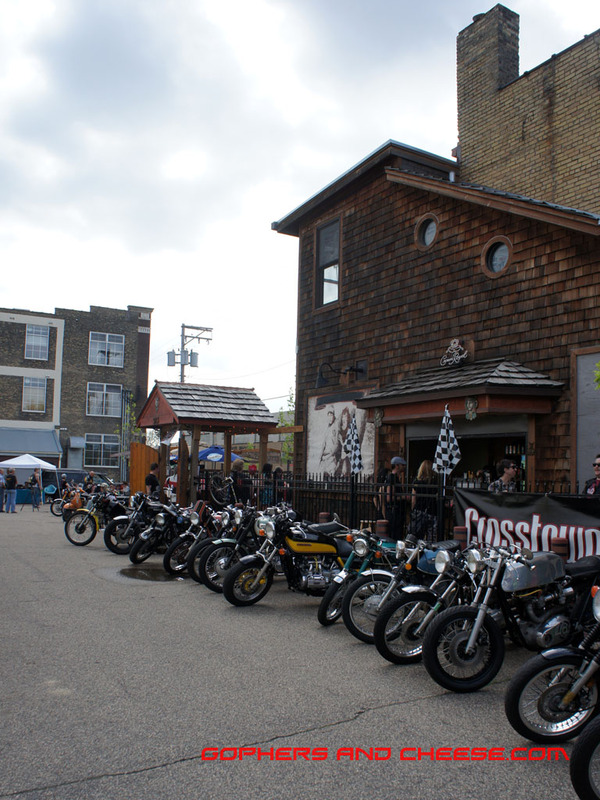 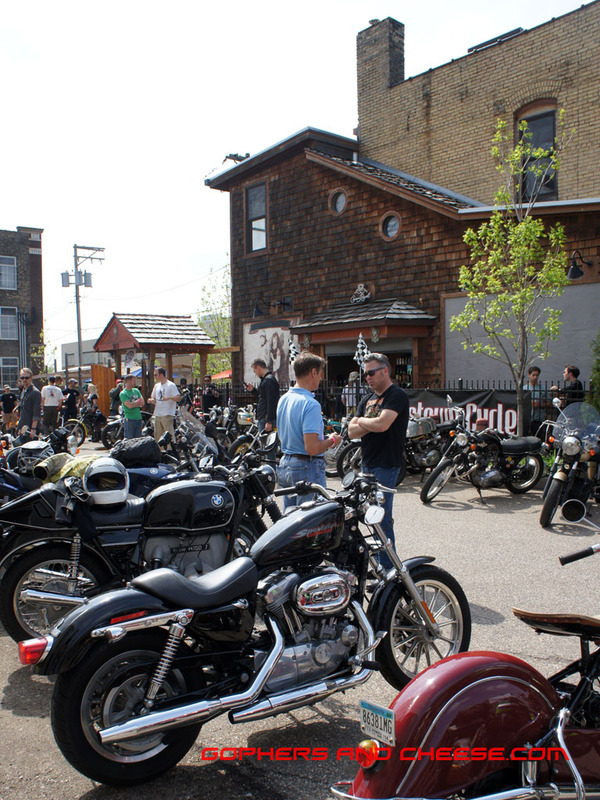 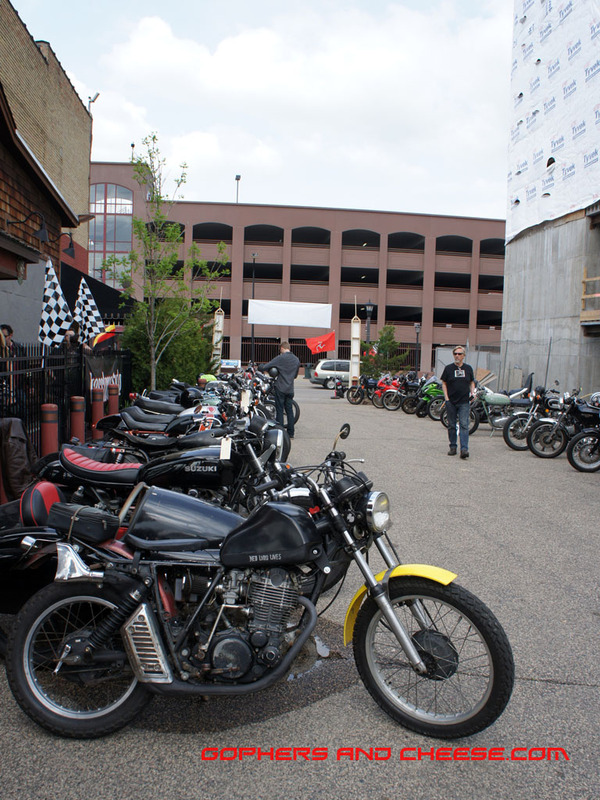 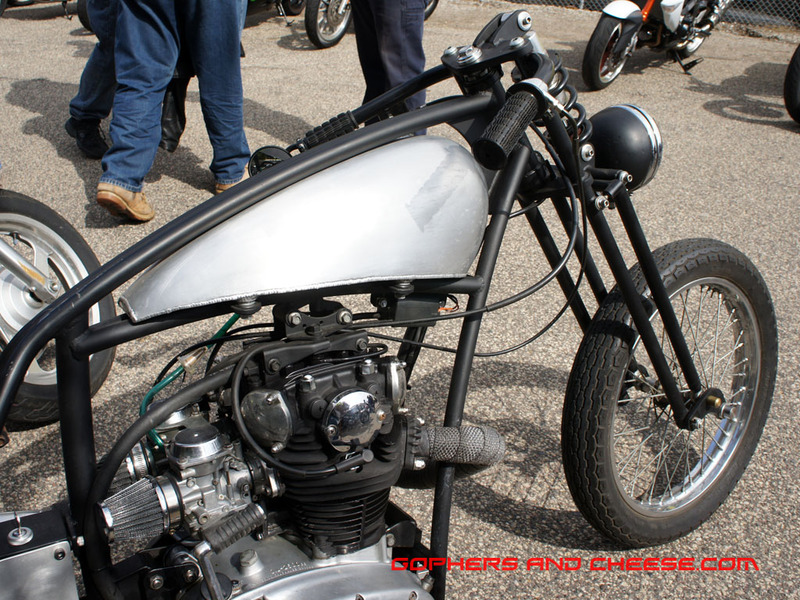 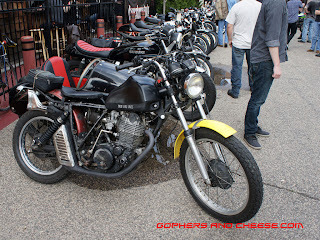 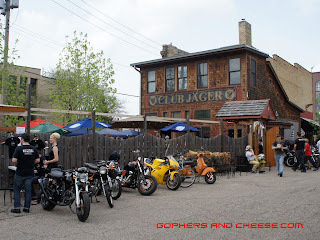 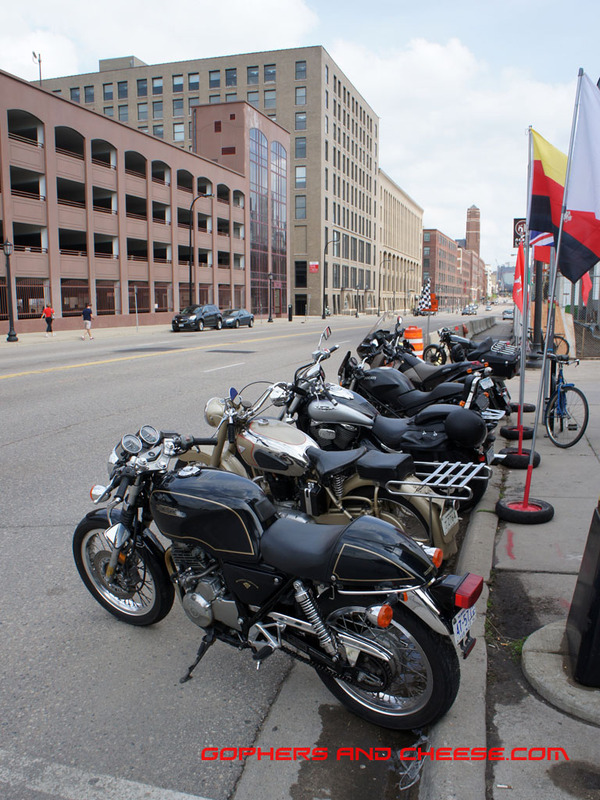 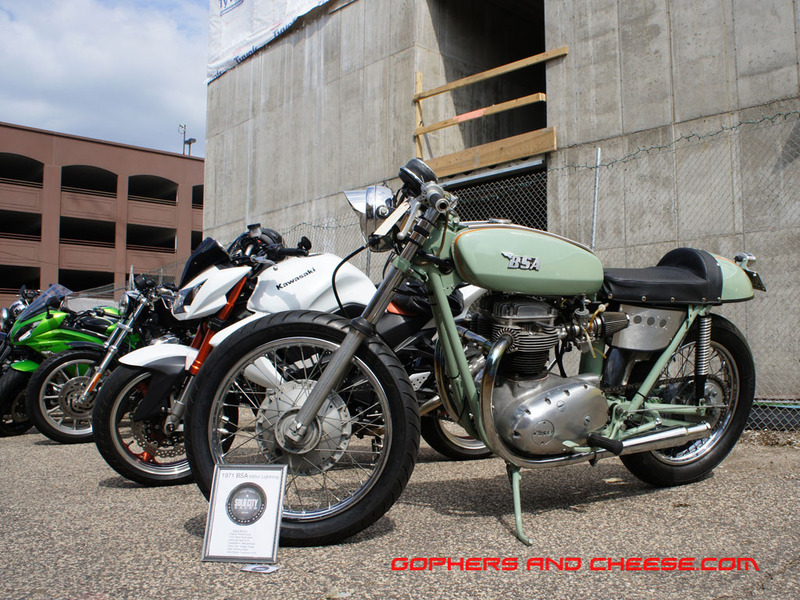 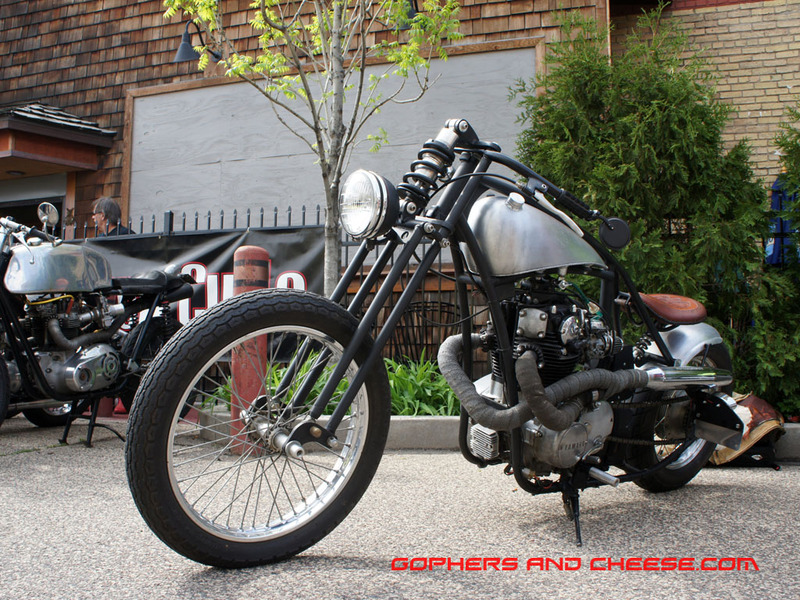 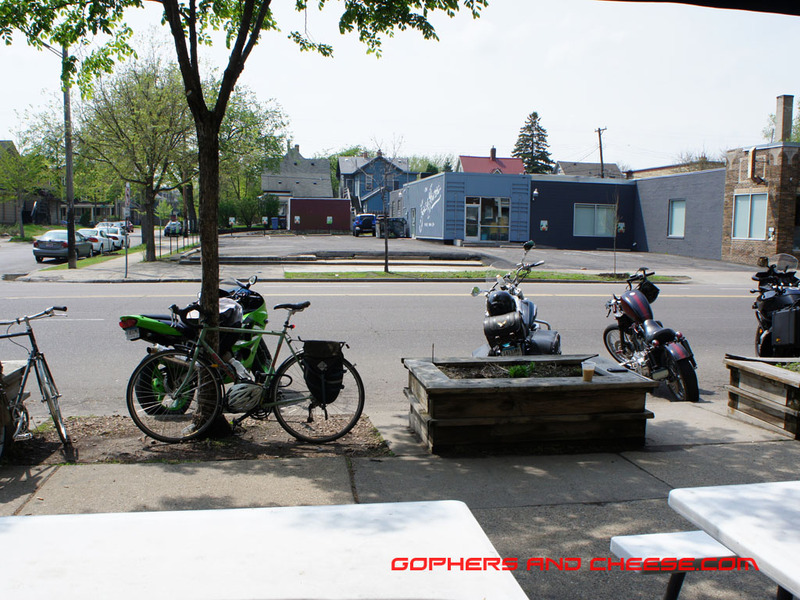 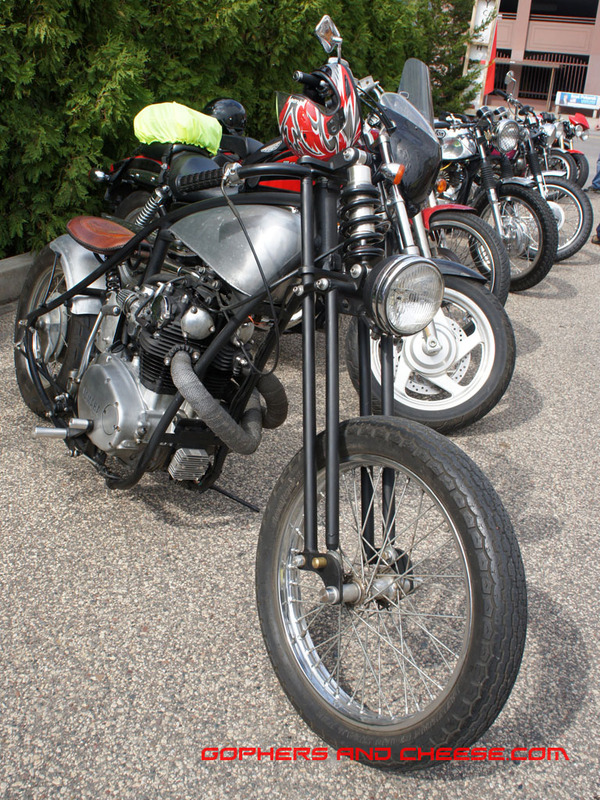 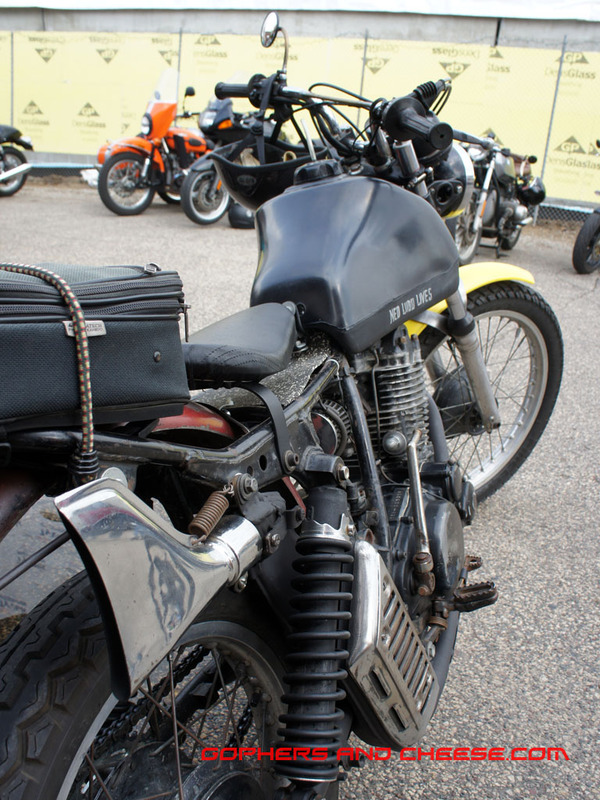 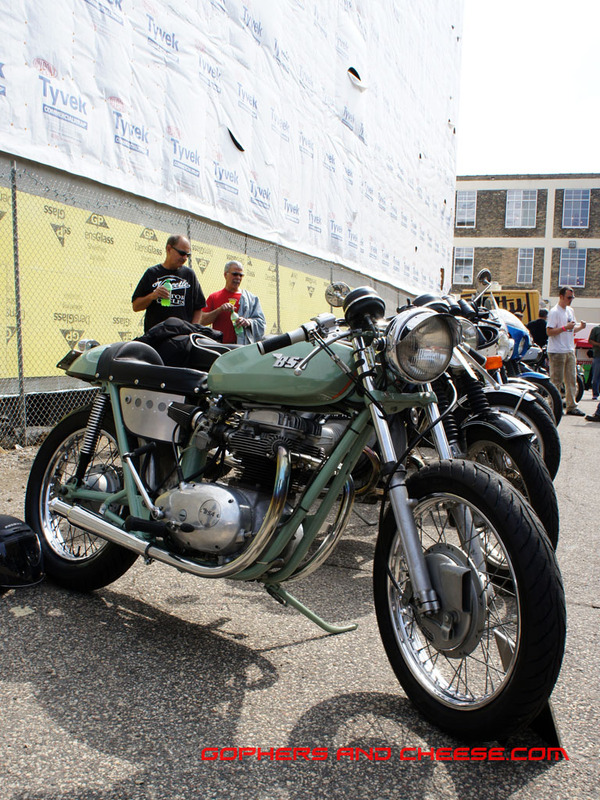 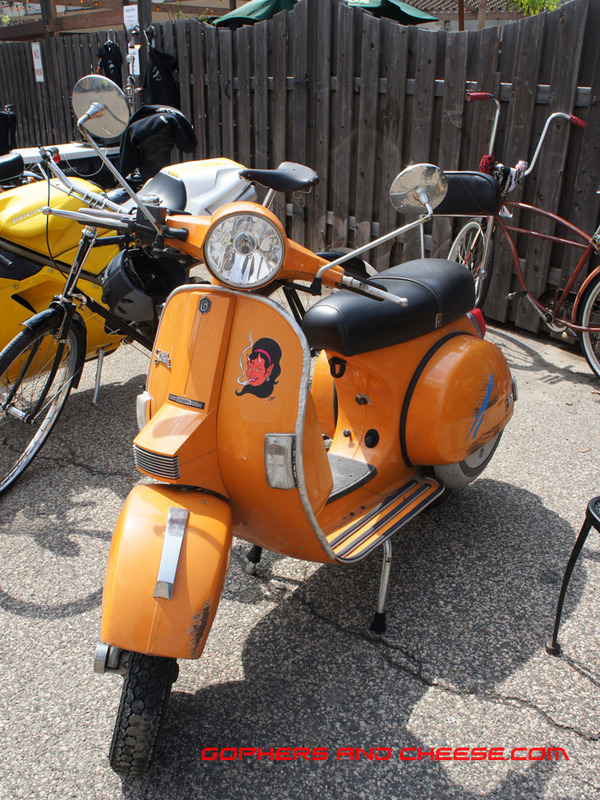 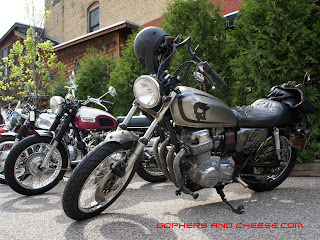 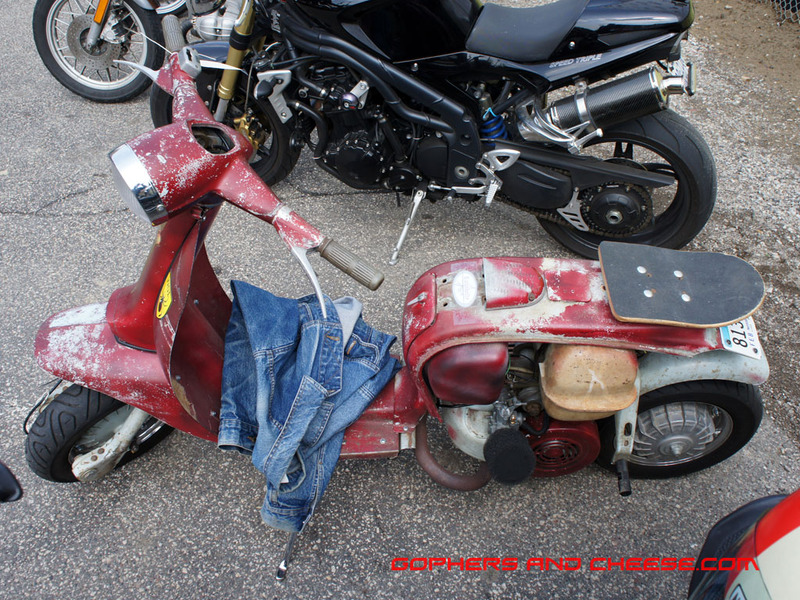 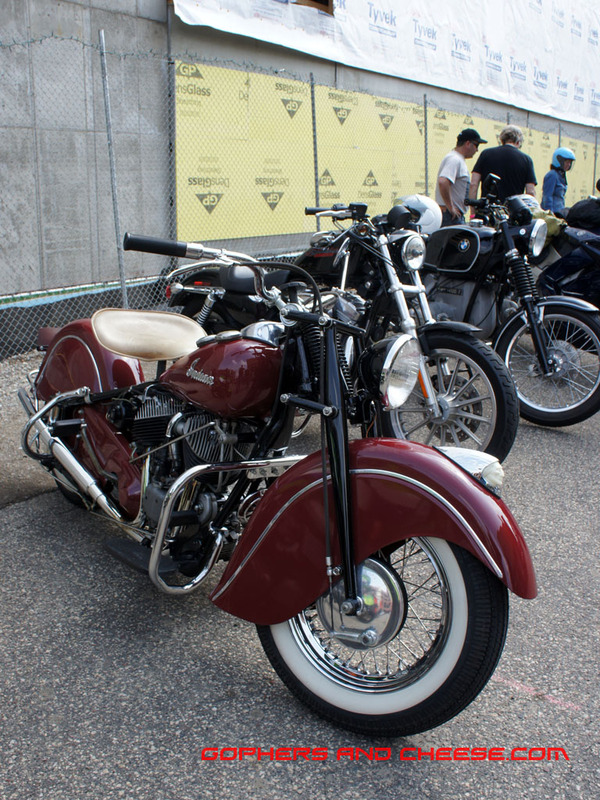 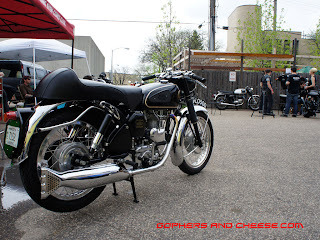 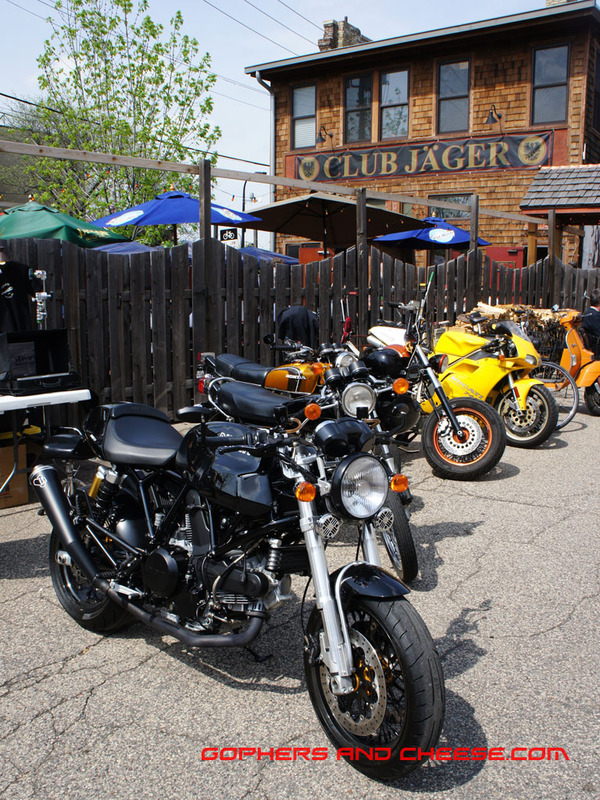 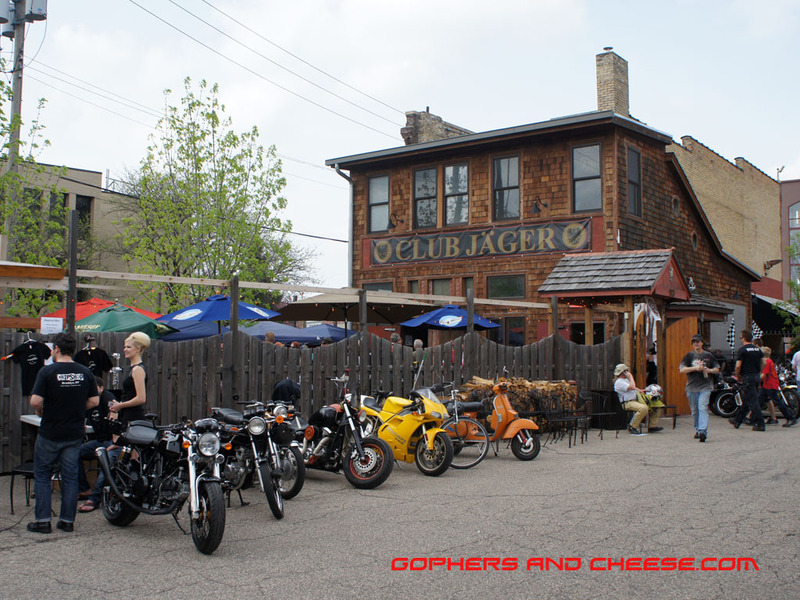 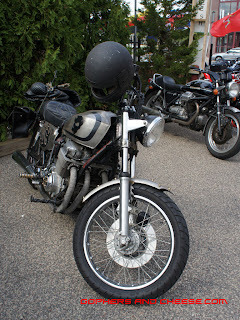 Between the Chopper Art Show 2 and the Rockers Spring Social, last Saturday was a great day to check out motorcycles in Minneapolis. For those of you who hate baggers (you know who you are), you would have been very happy at either show. 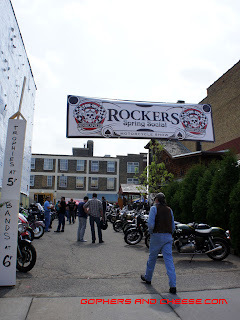 I didn't stick around for the awards or the bands but I had a good time while I was there. 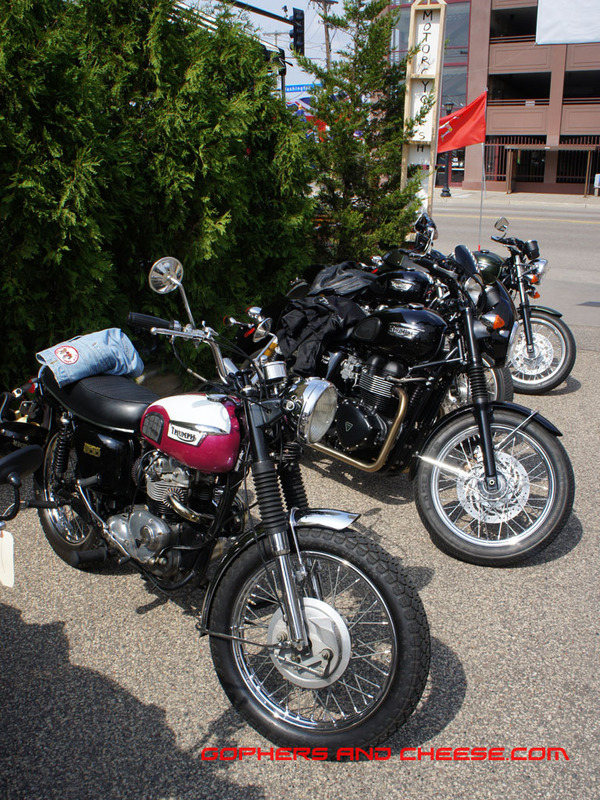 I'll leave you with three really beautiful bikes. 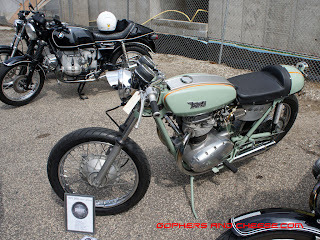 First up is a Triton. 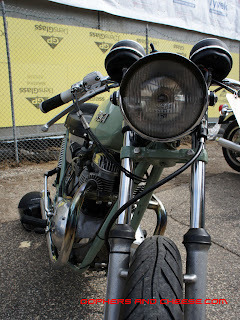 I like rock guards on headlights. 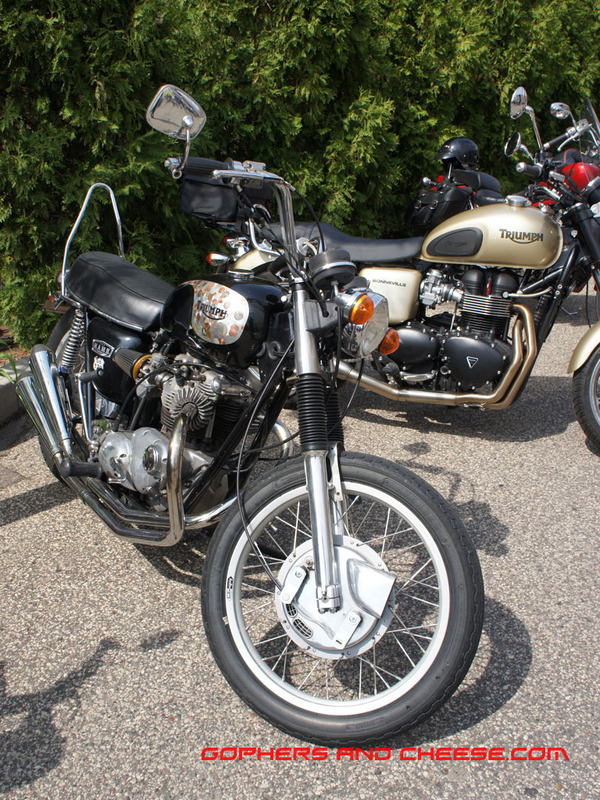 Next is a 1971 BSA 650 Lightning. 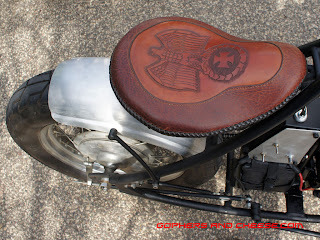 The color stood out but there are lots of custom details too. 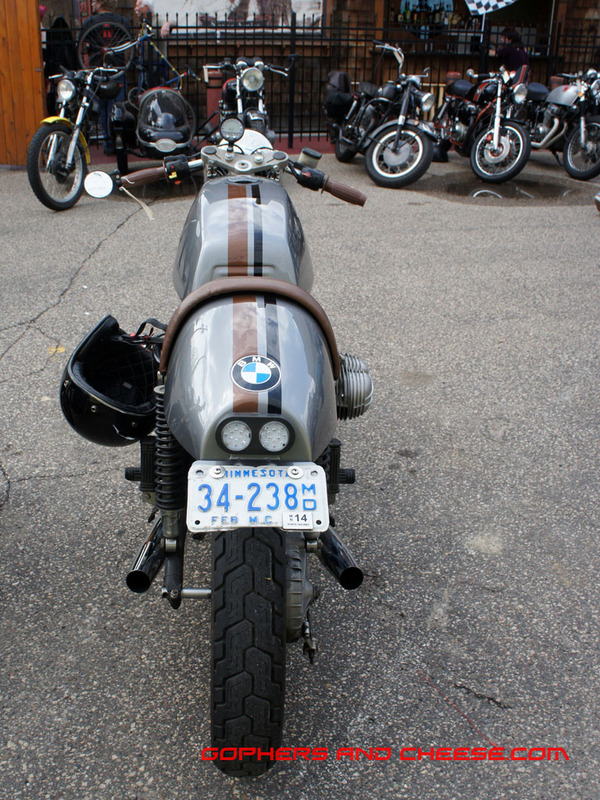 Finally, I just really liked this BMW. 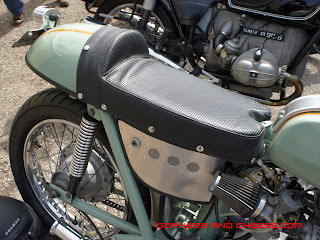 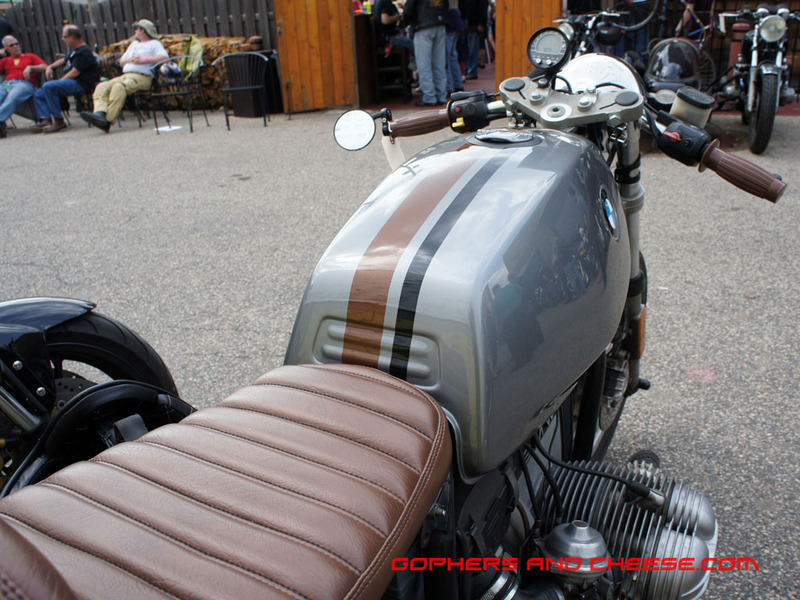 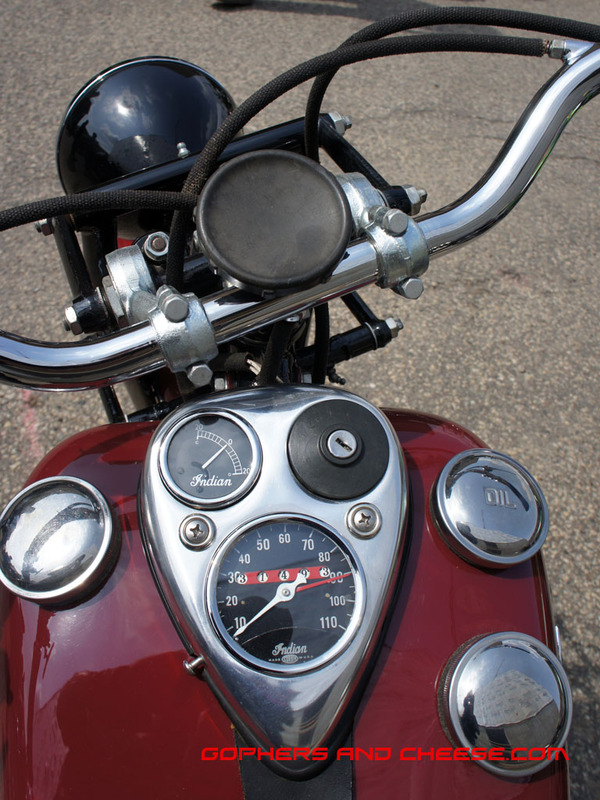 The brown leather seat and other brown accents are just perfect on this bike. If they do this event again next year, definitely go check it out! 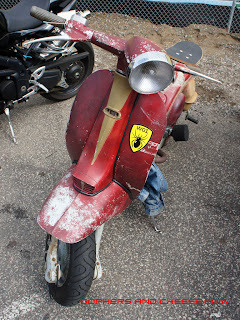 There were lots of cool bikes at the 2013 Rockers Spring Social but there were some scooters too! 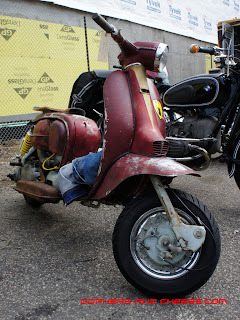 I would classify this one as a bit more of a rat scooter. 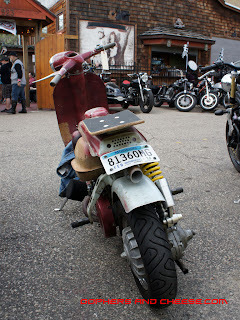 I like the skateboard seat and faded paint. 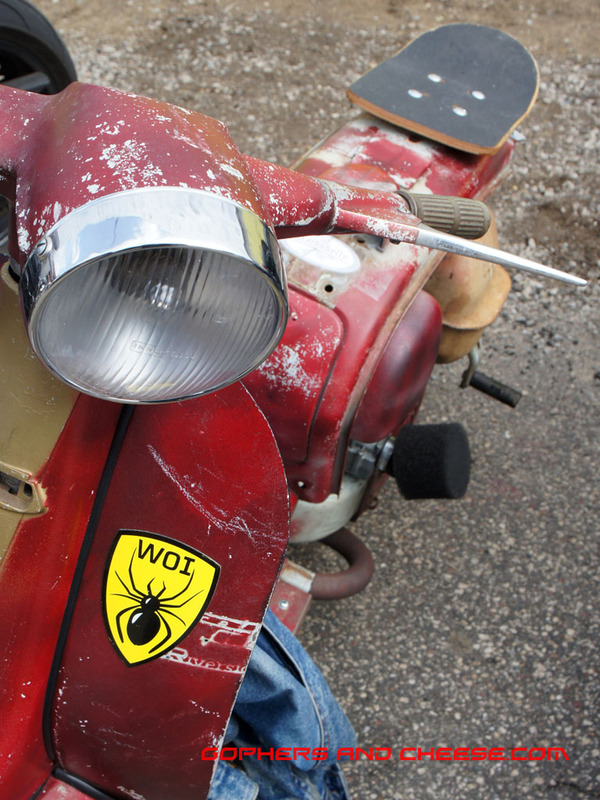 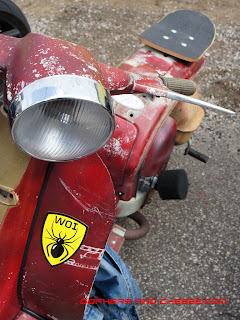 In case you're curious about the sticker, WOI is Wheels of Italy. 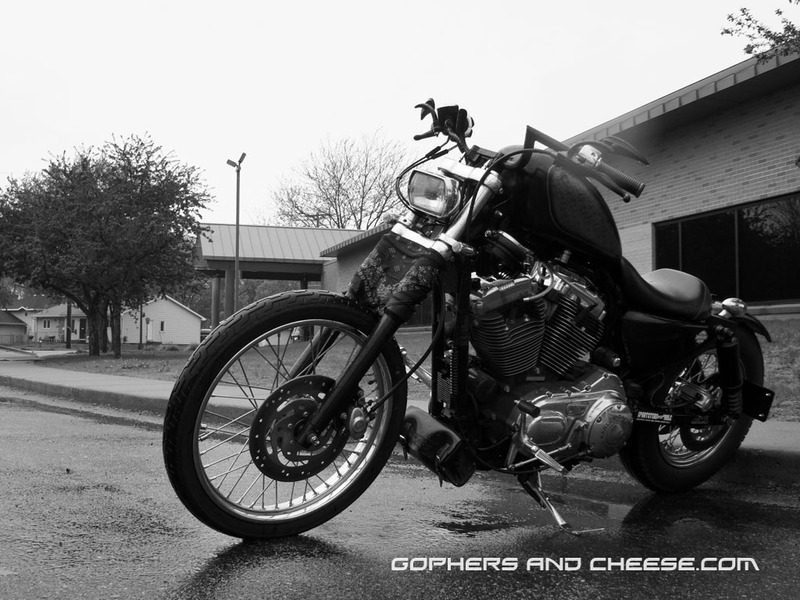 Speaking of rats, this bike looks far from stock. 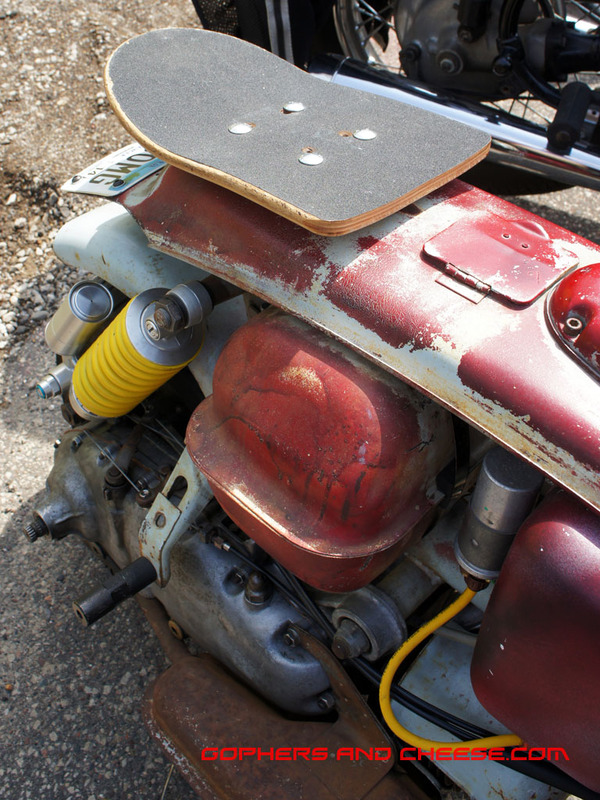 While not really a rat bike, this Honda had lots of homemade parts. 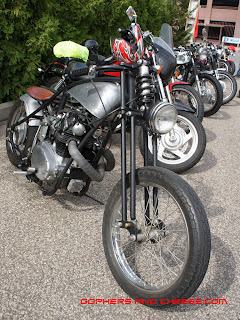 It turns out the Chopper Art Show wasn't the only place to see cool choppers last Saturday. 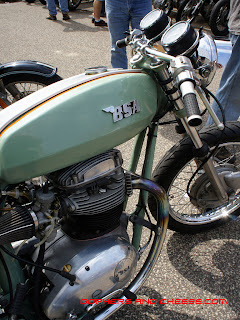 I really liked this Yamaha and started snapping photos as soon as it rolled up. 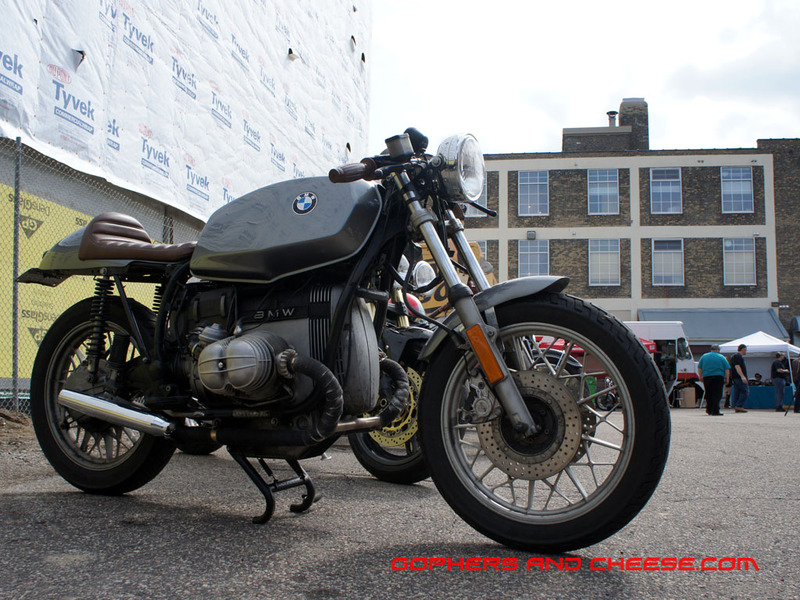 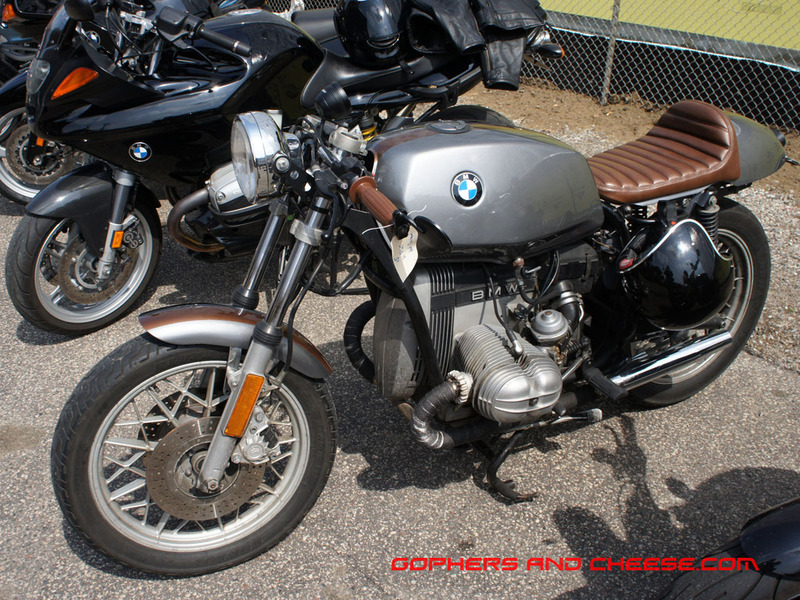 Come back tomorrow for a Beemer, a Beezer, and a classic British hybrid. 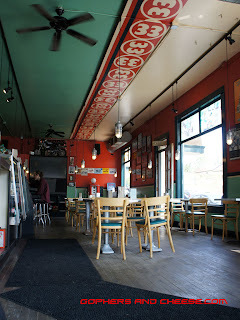 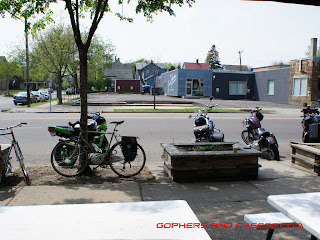 I left the Chopper Art Show and headed over to Bob's Java Hut for an iced coffee. 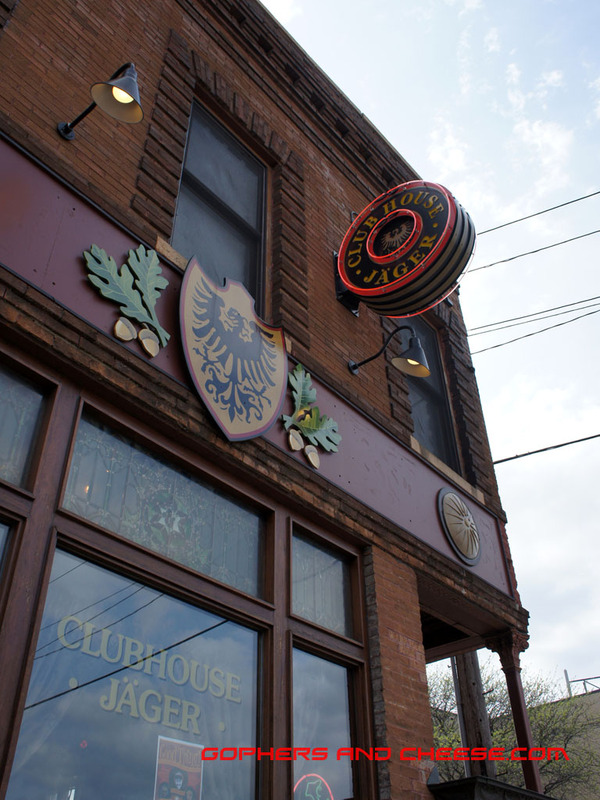 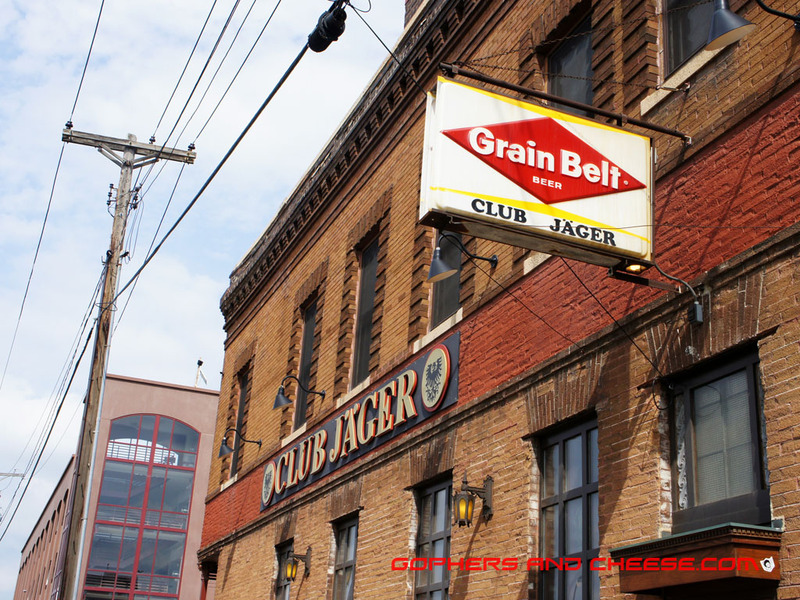 When I returned to Ton-Up Minneapolis' Rockers Spring Social at Club Jäger, it was much busier. It wasn't all European and Japanese bikes as you can tell by the Sporty above this classic Indian. 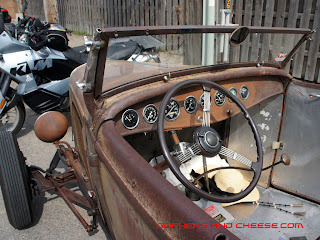 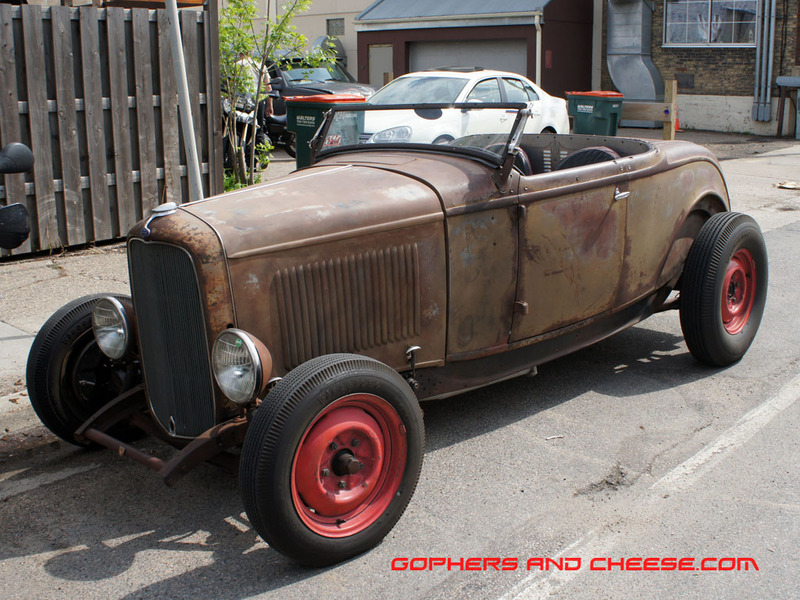 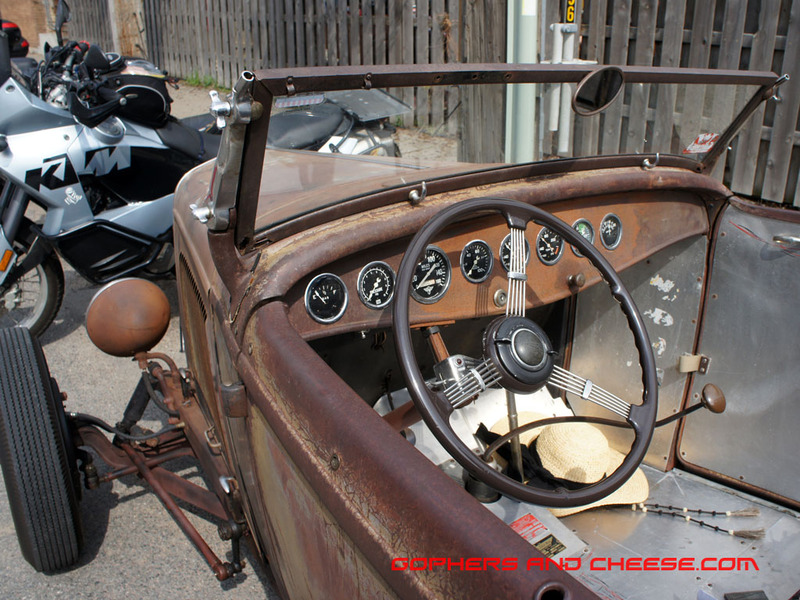 There was even a rusty old rat rod parked outside. I grabbed a snack at the taco truck. 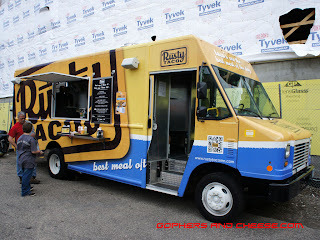 The Rusty Tacos (pork & pineapple) were tasty. I thought this was a neat trick. 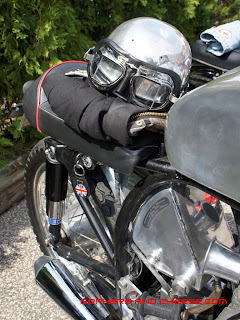 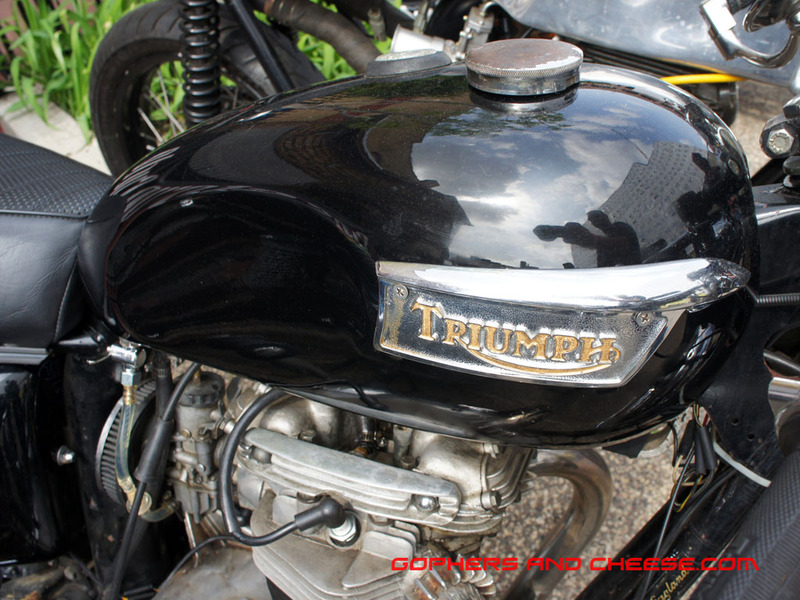 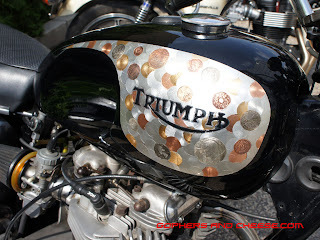 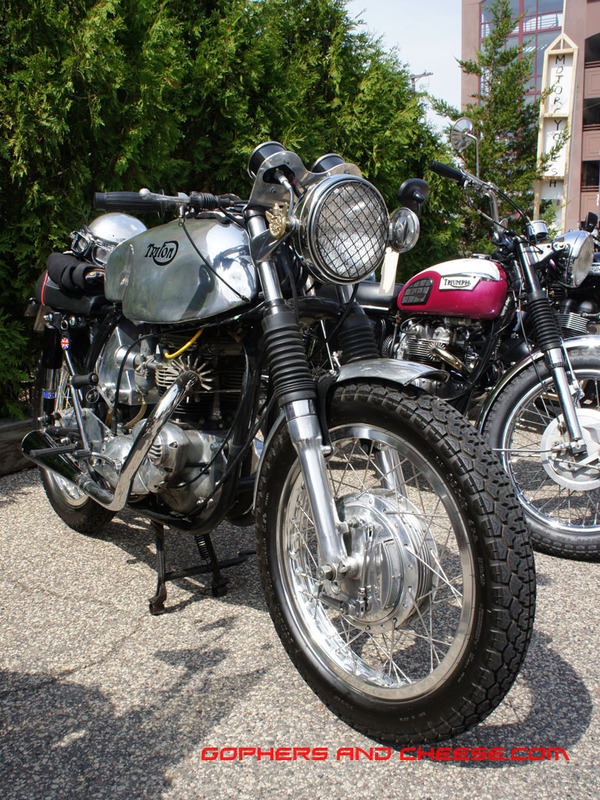 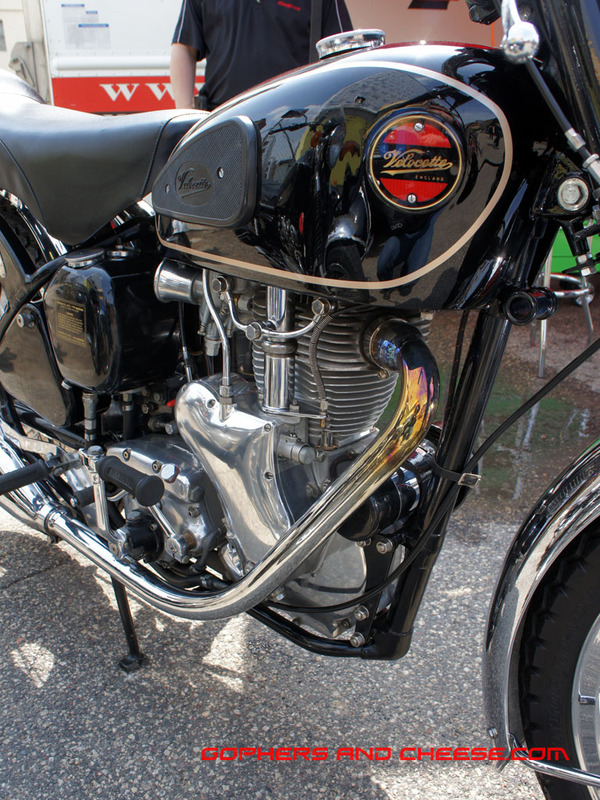 I think the tank effect on this Triumph was achieved with gold, silver, and copper leaf rubbed over coins. I wonder whether the owner is a numismatist. 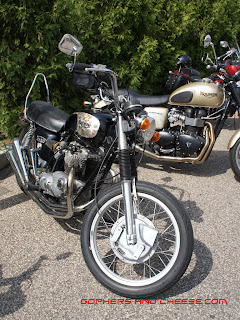 Speaking of Triumphs, this one has the emblem painted black and gold, just like my father's bike. I have two more photo-filled posts to go from the show including some of my favorites. 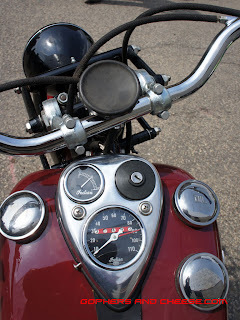 Check back this weekend.